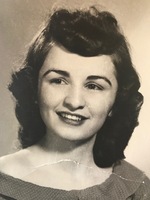 Delores “Dody” Elliott, 87, of Missoula, passed away peacefully, surrounded by her family on Sunday, March 3, 2019 at St. Patrick Hospital. Dody was born on September 9, 1931 in Missoula, MT to Bert and Louise (Joseph) Johns. She was the youngest of six beautiful Lebanese sisters. Dody attended primary school at Willard and graduated from Missoula County High School. In 1953, Dody married Stephen “Bruce” Elliott. The couple lived at the mouth of Rock Creek, MT where they owned and operated the Rock Creek Lodge. As Bruce escorted anglers to the blue ribbon trout stream, Dody managed the rest of the business. Bruce and Dody welcomed their daughter, Stephanie Louise, on June 5, 1954. Their son, Stephen Lee joined the family on October 26, 1955. As if she didn’t have enough to do, Dody opened “Dody’s Little Gift Shoppee” within the Lodge, so people could have treasures to remind them of their time spent in Montana. She found her calling in that business, so much so that she expanded it into much more. After the sale of The Rock Creek Lodge, Dody opened The Montana Copper Shop in downtown Missoula and, eventually, Polson, MT. Dody had a knack for marketing and was an amazing businesswoman. She used i to say, “People don’t buy if there’s any empty space!” For many years she ran the shops until she retired. For the last 12 years, Dody made wonderful friends and lots of memories at Burlington Square Apartments. With her granddaughters and daughter by her side, she took on the task of decorating the whole apartment complex for every holiday for many years. Just like when she ran The Montana Copper Shop, she covered every square inch of that place in decorations. Dody was beautiful inside and out. She loved shopping, and even more so, a good sale. It wasn’t uncommon to hear the “first price” and “last price” from Dody. It was always fun to go to The Bon Marche with her and see every salesperson greet her by her first name. She loved playing cards. She taught all the kids in the family how to play card games like Go Fish, Gin Rummy, Slapjack, and Poker. And you better believe she taught them how to hold their cards correctly and how to have a mean poker face. Her poker prowess even had her playing with the “gents” at The Oxford. She always looked forward to watching golf on Sundays with her niece, Diane Curry, and loved laughing with her best friend, Jane Joyner. Dody’s true love was her family. She made a point to always look after her nieces and nephews, offering unconditional love and endless generosity. She and Bruce built a home across the street from Stephanie and her family so she could be right next to her young granddaughters. We are so thankful for the thousands of memories we have of slumber parties at her house, parties in her backyard, huge family dinners around her dining room table, and Christmas Eve around her tree. Dody’s grandchildren and great-grandchildren will miss the way her eyes would light up when she saw them. Her love was palpable. Dody was preceded in death by her parents, Bert and Louise Johns; her sisters, Eva Khoury, Virginia Johnson, Angie Bryson, Adeline Briscoe, and Jackie Ward; her husband, Bruce Elliott; and her son, Stephen Elliott. She is survived by her daughter, Stephanie (Michael) Badzioch; three granddaughters, Marissa Badzioch (Seaghan Herron), Molly Badzioch and Mikaela Badzioch; her beloved great grandchildren, Sawyer Badzioch, Murray Herron, and Halas Badzioch; along with numerous cousins, nieces and nephews. We’ll miss you Mom/Grandma/Auntie, but we know you are at peace because your strongest desire was to be reunited with your son, Stephen. We love you the most! 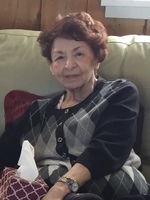 Please come share some of your favorite memories of Dody at Garden City Funeral Home for a celebration of Dody’s life Thursday, March 14, 2019 at 2:00 PM. Dody’s family requests that any donations be sent to Watson Children’s Shelter or to a charity of your choice. Provide comfort for the family of Delores "Dody" Elliott by sending flowers.